Toronto, May 12, 2010 – Guru Studio has once again partnered with Sheridan College Institute of Technology and Advanced Learning to nurture emerging animation talent. 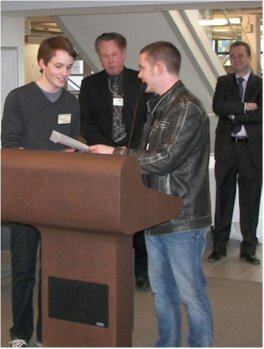 As an ongoing sponsor of the college’s Animation Industry Day, Guru Studio presents its 2010 Best Character Animation Award and $1,000 to graduate Kevin Parry for his short film ‘The Arctic Circle’. Told through stop-motion animation, The Arctic Circle is the story of greed in the wild, untamed north. “It was refreshing to take an old-school approach of having to know every single frame in my head before executing each shot,” Parry says. Parry’s goals with the film were to show confidence in his abilities and to portray his small set as a vast and open environment. He was surprised to learn he won the award for best character animation, he says. He adds, Guru Studio’s acknowledgment of his success is encouraging as he enters the work force. “I’m not the type of guy who is going to have this award ‘fall out’ of my briefcase when I go to interviews,” he laughs. Sheridan College’s Animation Industry Day is an annual event screening student work to industry professionals. Guru Studio has been a proud sponsor and active participant since 2007. Celebrating its 10th anniversary guru was founded with a mandate to create the best and most innovative character animated entertainment. The company has recently undergone a dynamic period of growth and creative evolution in its transition from service producer to independent entertainment company specializing in the development, animation + design of promotional content, serialized productions and features for television, film and other screen based media. Guru has also embarked on a series of short films, including YEAR of the POLYGON and PANOPTICOM. All 3 of their shorts have been showcased at the Pictoplasma Character Design + Animation Festival in Berlin and the Ottawa International Animation Festival including their most recent release, HAZED which screened at over 20 international film festivals and won several awards. Guru works with brands, advertising agencies, broadcasters, producers and development companies and maintains an impressive roster of international clients such as DDB, Ogilvy and Mather, Draft FCB, Leo Burnett, Kraft, Proctor & Gamble, Tropicana, Kellogg’s, YTV, Teletoon, Cartoon Network, Hallmark Entertainment, Corus/Nelvana, Family Channel and Nick Jr.
UPDATE: Kevin’s work can be seen on his blog, here. And if you want to see Kevin’s film, it’s on Vimeo, here. You’ll need to enter the password to see it though, it’s “arctic”. This entry was posted on Wednesday, May 12th, 2010 at 10:02 am	and is filed under News. You can follow any responses to this entry through the RSS 2.0 feed.